Playwright Mark O&#146;Rowe&#146;s lively compression of the second part of Shakespeare&#146;s tetralogy of &#145;history plays&#146; detailing the ascension to power of Henry V is the stage equivalent of an action movie. Stripping language and characterization right back in favor of highly specific narrative threads emphasizing the masculine struggle for power and respect, the play moves quickly, deals with a few simple themes in a very straightforward manner, and finishes up with a damn good swordfight. Following the events of Richard II, the alliance which brought down the King is about to come apart. Henry sits upon the throne, still trying to relieve his guilt by calling for a crusade against pagans in the Holy Land, but finding his domestic political situation enough to contend with for the moment. His reluctance to give his former friends much influence, let alone credit has left them bitter and resentful. Worcester, Northumberland, and Northumberland&#146;s son Percy bring their grievances to the King following Percy&#146;s victories in Scotland, but Henry is unmoved. He is regent now, and fears for his own succession. His son Hal is a feckless layabout, more enamoured of carousing with disreputable characters in a tavern than planning high minded campaigns. Henry looks with envy and despair at young Percy&#146;s pride and ambition, admiring and fearing him all at once. The stage is set for rebellion, and for the slow rise of a young man to the dignity of kingship which will take two further plays to see full fruition. 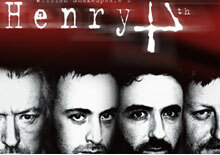 The grand narrative of succession which defines the tetralogy hangs heavily over editor Mark O&#146;Rowe and director Jimmy Fay&#146;s vision of the first part of Henry IV. It would be interesting to see the collaboration continue across the remaining chapters, as they have certainly found the clearest route to setting the scene for Henry V. In a characterization which is perhaps too assured Tom Murphy (A Life) portrays Prince Hal as an extremely focused young man. In spite of some pretence to flippancy, the character is already detached enough from his would-be mentor Sir John Falstaff (Sean Kearns) as to make his affection for him less a hesitation between respectability and roguery than a momentary rest stop along the way to becoming King. There is never any real doubt that he will abandon these people in due course, and no irony to his dutiful service to his own treacherous father. When Hal agrees to let Falstaff take the credit for the killing of Percy, one gets the sense more that he has dropped him a crumb from his table than truly acknowledged his kinship. This is an intimate and exciting production which has been mounted with the avowed aim of energizing the text for a contemporary audience. Retaining the original language but cutting the dialogue down to a fraction of its original length, O&#146;Rowe cuts a swathe through the poetry of Shakespeare&#146;s words in favor of getting straight to the point. Purists may be appalled, but tastes have changed. What was popular theatre in its day can sometimes seem studied and distant today, and revisions of the Bard have been going on almost since day one. It should therefore be no surprise that in attempting to connect with an audience weaned on sound bites, this production goes in the direction that it does. A cast of nine including David Pearse (Alone it Stands), Arthur Riordan (En Suite) and Ronan Leahy (Da) work hard in multiple roles to retain some sense of the scale of the drama, but essentially the play has been tightly wound around the crisis of "the father with two potential sons, and the son with two potential fathers," as Gerard Stembridge notes in the program. This works very well and in a particularly masculine way, though the director and editor did eventually accede to the inclusion of a female actor in the person of Niamh Linehan, who also plays multiple roles (including rebel knight Sir Richard Vernon). Murphy makes a good Hal, but is more than matched by Declan Conlon as Percy. O&#146;Rowe plays upon the dialectic conflict between the characters, which allows both actors to build psychological, narrative, and thematic tension. Sean Kearns is a reasonably interesting Falstaff, if not a truly magnificent one, though Nick Dunning (The Homecoming) seems overburdened with invisible dramatic weight as the title character so clearly upstaged by events which have yet to come.